The FEEDER product line is dedicatedly developed for supporting thickness and basis-weight gauges with their measuring task. It can be applied in a setting together with our Marveloc 602-CURTAIN, performing thickness measurement or basis-weight measurement. A feeder product typically transports sample material specimens through the measuring machine for R&D purposes or offline validation of materials. Using the feeder, a full coverage of a material sample can be realized, which makes it an outstanding choice for thorough analysis of your product's quality. 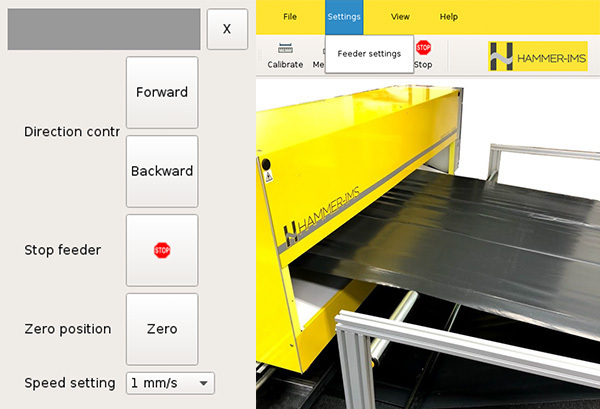 The compact and low weight FEEDER products can be operated through the Connectivity 3.0 software that controls the Marveloc 602-CURTAIN measuring system. Give this video a try and find out how this feeder system could be useful for you. The FEEDER systems consist of a strong and solid mechanical construction. 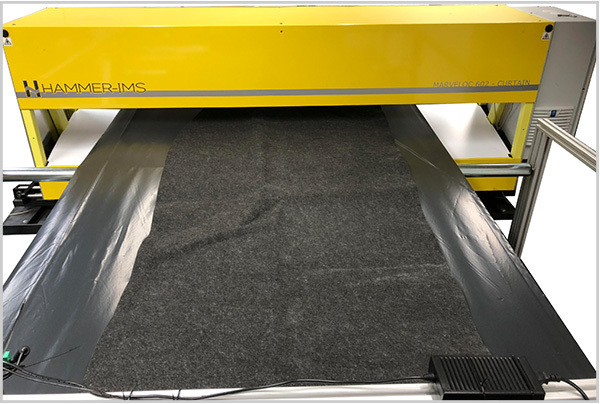 Any feeder system we deliver can work as an add-on to the Marveloc 602-CURTAIN measuring machine, and is therefore designed to be controlled through the Connectivity 3.0 software of the measuring system. Feeders at Hammer-IMs exist in two flavours: one version uses a fixed PVC sheet which is positioned within the Marveloc 602-CURTAIN's measurement gap and two transport belt sections (one taller up-stream and one smaller down-stream). The transport belt sections are connected by means of the PVC sheet. This kind of feeder can easily be dismantled and stored for later use since it does not use a single belt-loop which travels through the Marveloc 602-CURTAIN. However, this first flavour requires that the material to be measured does not create too much friction with the PVC sheet such that the material keeps on moving whenever it slides over the PVC sheet. The second flavour uses a single belt-loop of thin PVC film which is fed through the measurement gap (see figure aside). These two flavours alows us to provide solutions for any sample of nonwoven, textile, foam, film or sheet. As a result, R&D engineers or production staff can evaluate the samples’ thickness, basis-weight or even anomalies (inhomogeneous sections, holes large and small, etc.). 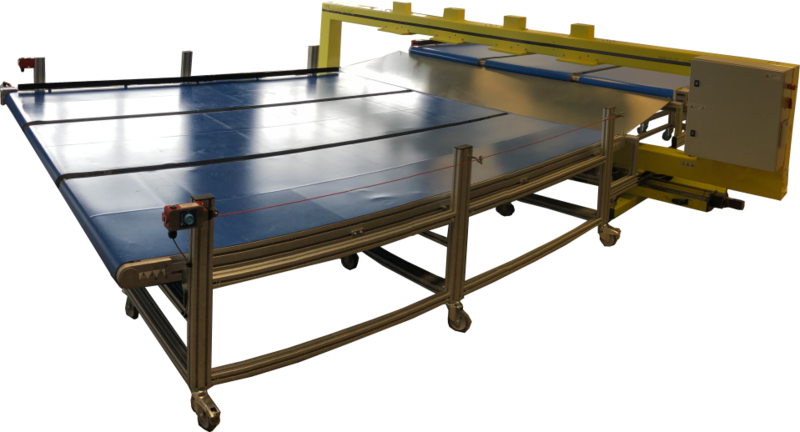 The FEEDER product line is developed for facilitating offline thickness and basis-weight measurements and anomaly detection. Samples of any material can be put on the plastic transport belt: nonwovens (needlepunching, bonding, tufting, etc. ), textiles (lamination, coating, etc. ), physical and chemical foaming processes, plastic films and sheets, etc. Connecting a FEEDER system is straightforward. The power assembly of the feeder has a cable with a regular power plug. A usb-cable is provided to connect the power assembly with any Windows or Linux-based computer. It can also directly be connected to a computer which runs Connectivity 3.0, our proprietary control software. The feeder is then operated through the Feeder Settings dialog box of the Connectivity 3.0 software. From this dialog box, users can select the transport belt direction and its speed. 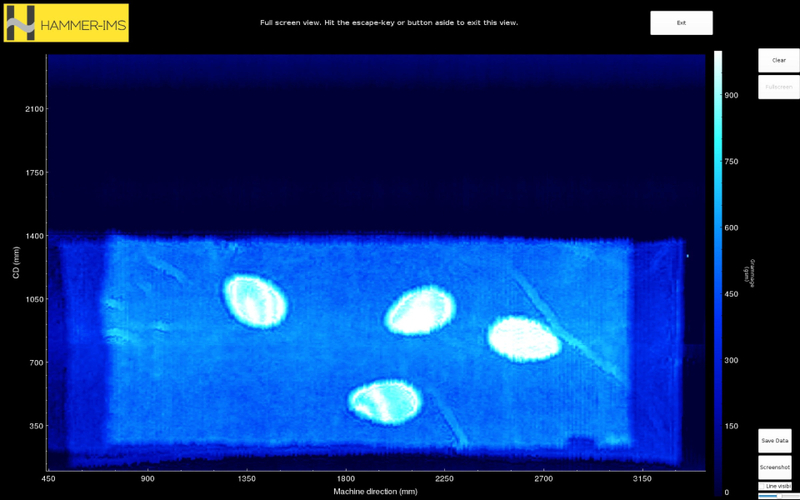 Connectiviyt 3.0 also tracks the feeder's position, enabling generation of 2D-scan data. Using a feeder allows you to create highly-detailed color maps in our Connectivity 3.0 software environment of your product as shown in the figure aside. This helps understanding more about your product. Contact Hammer-IMS for further details. Hammer-IMS nv is a spin-off of KU Leuven. Hammer-IMS develops and commercializes measurement systems to improve product quality and production efficiency. Welcome Bram, the stage is yours!